Young people the world over face challenges that prevent them from reaching their fullest potential. 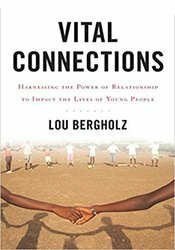 Lou Bergholz has spent decades working for children and adolescents from Boston to Zimbabwe, and he found that the caring adult relationship holds the key to supporting them as they navigate their journey to adulthood. More than enrichment programs or activities, young people everywhere need Vital Connections. In this essential resource, Lou offers six powerful techniques that enable youth workers to reach out to, connect with, and positively impact young lives. From using powerful praise and affirmations to making time at the right time, these valuable strategies will foster self-efficacy, healthy decision-making, and resilience. And these tools will help you help young people truly believe they can succeed. What young people need can be varied and complex, whether you're a counselor, educator, parent, or coach. For many, the stakes are incredibly high. Vital Connections can make all the difference. Lou Bergholz, chief knowledge officer at Edgework Consulting, has spent the last 20 years working on creating trauma-sensitive interventions in the US and abroad that apply academic research and clinical practice to populations, often without reliable access to definitive clinical care, including at the Justice Resource Institute, CARE International, and Street Soccer USA in Gaza and Thailand.